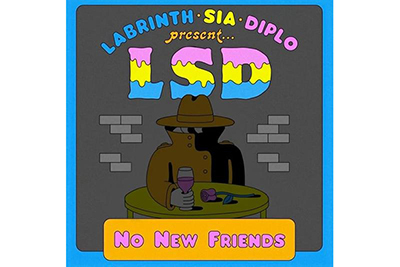 "No New Friends" is a song by LSD from the group's upcoming album of the same name, released by Columbia Records. The song serves as the album's fifth single, following "Genius", "Audio", "Thunderclouds", and "Mountains". "No New Friends" is a pop song with electronic dance music (EDM) influences, and has a "thumping" dance beat with "bouncy" synth loops by Diplo, as well as harmonized vocals by Sia and Labrinth.